Ringwood, July 2018 – Healthcare Computing has won the Healthcare Sector Partner of the Year Award at the Fujitsu UK Channel Awards. Fujitsu recognised their channel partners who have delivered outstanding value through digital co-creation with their customers. Fujitsu has rewarded Healthcare Computing for their exceptional achievements combining their expertise and services with Fujitsu’s extensive product and solution portfolio to implement innovative and customer-centric projects. 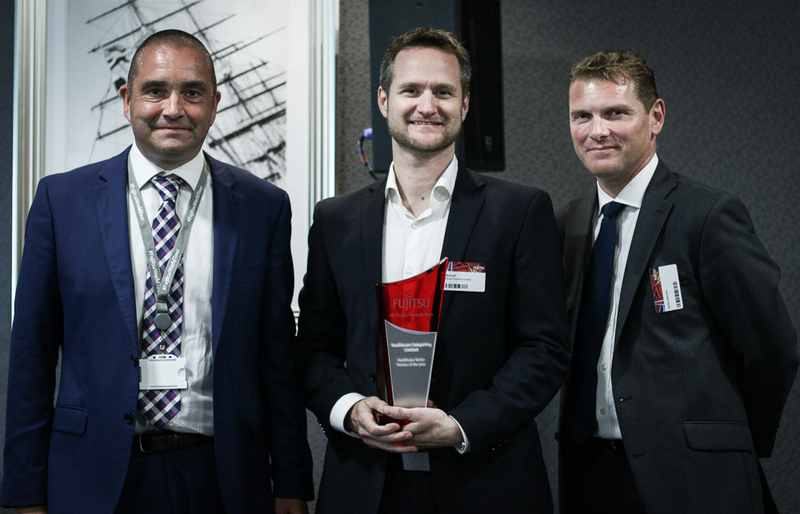 Healthcare Computing was honoured at the Fujitsu World Tour London on the 12th July. Digital transformation for business was the focus at the Fujitsu annual World Tour held in London, with speakers examining how organisations can work together to create new possibilities for business and society through transformation. Healthcare Computing was established in 1996 and provides NHS IT Services and Solutions to GP Practices, CCGs, CSUs & local health economies. HC is consistently recommended by customers as its solutions represent excellent value for money, while team members are skilled, driven and passionate about technology. © 2016 Healthcare Computing Ltd. All rights reserved.